Cartwright Hall Art Gallery01274 431212work Art GalleryCartwright Hall is Bradford's civic art gallery and offers an exciting programme of contemporary exhibitions, with four permanent galleries displaying works from our art collections. The collections consist mainly of 19th and 20th century British art, with strong collections of international contemporary prints and contemporary South Asian art and crafts. This gallery dedicated to the work of Bradford born artist David Hockney, showcases Bradford’s unrivalled public collection. It includes early work and provides an introduction to his life and art with a particular focus on Yorkshire and Bradford. 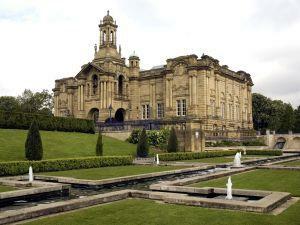 Cartwright Hall is set in the magnificent, Green Flag-awarded grounds of Lister Park, with a boating lake, adventure playground and Mughal Gardens. Stroll around Lister Park to view sculpture and public artwork, some on loan by the artists, others from Bradford’s own collections. There is also a privately run cafe in the Lister Park boat house that serves hot and cold drinks, food and ice-cream. Open April - September, 12 noon -7pm; October 11am - 5pm (weekend only). If the weather is good you may find the cafe open outside the usual hours! Telephone: 01274 487312. Closed: Mondays (except Bank Holidays), Good Friday, Christmas Day, Boxing Day and New Years Day.